Our Smart Teapot is a patented design. One just need to press a button on top of the teapot lid to release the liquid. Suitable for personal or guest use. Can be used to brew tea or coffee. Ideal to be used at home, in the office, during vacation, in a restaurant or even in a teahouse. The Smart Teapot is the most convenient and easy way to brew tea. Comes with a tea free tea scoop. Available in 200 ml (6.76 oz) or 500 ml (16.9 oz). Made in China of food-grade plastic. How to use Smart Teapot? Put tea leaves, tea bags or coffee grounds into the inner cup. When the button is pressed, tea flows and is filtered automatically; tea and tea leaves separate to avoid oversteeping. Use the outer cup as a serving pitcher. 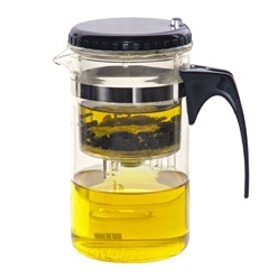 Use the inner cup to continuously brew tea or coffee. I love this teapot. Excellent device. Easily cleaned. I like this tea pot. It is easy to clean. Also it shows off very nicely the clarity and the sparkle colour of many good teas I bought from Teacuppa. But I would prefer the lid can be tightened instead of loosely resting on the top of the filter.